Performance marketing advertisers have a tough job. Every vertical is highly competitive. Publishers are constantly on the lookout for better offers and commission rates. And the marketing technology stack is forever growing more complex. How to cope? Any successful advertiser will tell you that selecting a good CPA network partner is the first and most important step on the road to growth. A great network will help the advertiser navigate the competitive landscape, recruit and manage affiliates, provide technology advice and assistance, and allow the advertiser to grow their business without distraction. For the last two years the Blue Book rankings have rated Clickbooth as the best CPA network in the world. The votes that carried them to that #1 position came largely from advertisers. They told us they loved Clickbooth’s advertiser interface, the integrity and support from the advertising managers, and the breadth and scalability of Clickbooth’s traffic. In a very competitive field, Clickbooth stood out from the crowd for sheer professionalism and the excellence of their platform. But once away from the survey questions and multiple response answers, does the real client experience match Clickbooth’s reputation? Do customers feel that Clickbooth delivers on their industry-best rating? We talked with some of performance marketing’s leading advertisers across multiple verticals to find out. Customer service is always near the top of the list of requirements for advertisers and our four industry leaders were no different. What became clear during our conversations was the extent to which the long-term industry knowledge carried by the network’s leadership team has been shared down to ad manager level. Clickbooth was our first foray into using a network partner and it has been a resounding success. They are consummate professionals and our ad rep, Allison Stewart-Bartley, is outstanding – I really feel like she should be in a cubicle down the hall. She’s fantastic. They’re becoming a really key partner for us. We used to do most of our media buying in-house but they give us runway which lets us try new stuff more easily. The best thing we can say about Clickbooth is that we don’t want anyone else to find out about them. They’ve been really solid. We have dealt with other networks but sometimes they don’t respond for days. Clickbooth is never like that. Having a good ad manager is important and Mike Sinclair delivers. He is quick to respond and has experience in the business, but he’s still very curious and wants to understand what we do. He gives us the sense that he knows what works and it’s not just lip-service. He has become part of our team because he is always willing to go to bat for us. 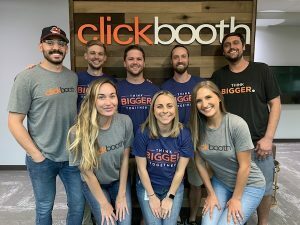 The degree of support provided to these advertisers by their ad managers may seem surprising to many merchants working with smaller, less-established networks, but it’s what has taken Clickbooth to their leadership position in the industry. We have found Clickbooth’s support is terrific. Our director of business development, Tyler Morrow, is very responsive, which is important, and his insights are valuable. If we weren’t able to call on the expertise of someone as qualified as Tyler, the whole process of building and running a campaign would be much harder. We typically have up to 40 publishers running on any given campaign, with a dozen or so producing most of the business. We get a lot through display and native. Given the payment processor rules it’s very important to us that we get consistency from our network. We can’t have a massive month followed by one in which some other brand buys all the traffic. We need a pretty consistent level of business and Clickbooth works with us to maintain that. Brian’s issue and the solution provided by Clickbooth exemplifies the advertiser benefits that can only be offered by networks with a lot of scale. You need large traffic volumes to be able to smooth out seasonal highs and lows for an individual merchant, and that often comes from a variety of different sources. We have worked with Clickbooth since February, 2017. It’s a productive and profitable partnership. It makes a strong case for advertisers and networks to evolve, professionalize and grow together. Clickbooth can provide all kinds of traffic so we do a lot with social, search, display, SEO, etc. We are strict on placements, but we work closely with publishers to help them identify their target audience. We provide analytics and targeting insights to publishers all the time because ultimately they only want relevant traffic and so do we. Clickbooth works side by side with us on this. At first, we concentrated on our own internal media-buying, and moved into using a CPA business model much later. Clickbooth has been with us from the beginning and, most importantly, they share our values. They’re always ready to listen and to work with us to find more growth. Some months Clickbooth accounts for 80% of our volume. They have shown they can scale and that they are willing to go out and find new partners and affiliates. We have worked with other well-known networks and had a couple of bad experiences so it was refreshing when we talked to Clickbooth and they came with feedback and ideas of their own. We have worked with other networks but Clickbooth have proven themselves to us. They can bring audience to us, literally thousands of customers within two or three days. We are doing a lot of business with them. Clickbooth have an exclusive deal on our products. It’s a good relationship. Giving them an exclusive provides us with volume and attention, both of which really help a product launch. Clickbooth’s platform is great. It is important to us that a network platform provides an advertiser interface. Time zone issues and the fact that our sites are open worldwide means that access to the platform and to reporting is critical to us. We run three or four campaigns at any one time with traffic coming from display, social and email and passing into our CRM system via APIs. The link-up has to be spot on so our advertising manager brought in Clickbooth’s tech guys to work with us. They were with us all the way through the integration. It works great. We don’t have our own tech team so we outsource. Clickbooth even helped us with that by introducing us to our eventual choice of tech partner. It suits us well as it means that optimization can be done after hours or whenever. Once the technology has been engineered, the publishers recruited and the campaign launched, a performance marketing advertiser still faces the day-to-day challenge of managing the campaign in a sustainable fashion. Fraud, while it still exists, is now a well-understood and manageable problem, and so perhaps the most pressing issue, particularly for newer advertisers, is the question of brand protection. The performance marketing industry relies upon networks of thousands of individual publishers and media buyers, each of which is constantly trying to find new and more effective methods to convert website visitors into customers. As a result, it not a surprise that some CMOs still put brand protection as their primary concern when considering performance marketing as part of their marketing solution set. As an industry leader, effective brand protection has become an essential deliverable for Clickbooth. We have our own approach to the business. Unlike some others we don’t rely on aggressive upsells, for example. Instead we focus on customer service. We have our own call-center which really helps us to reduce cancellations and payment processor issues. Clickbooth are very good on brand protection. You always have to be aware of the possibility that some publishers might push the envelope but Clickbooth has had controls on it from the beginning. They worked with us to develop our publisher agreement initially and it has evolved over time. Now we don’t see brand protection issues at all. Our mission is to make people happy, so we really focus on improving the user experience and offering a super-clean interface. It’s part of professionalizing the industry and we work on the basis that if we get the product right then profits will follow – and it is working. Just as with Clickbooth as a network partner, with publishers we seek to develop long-term relationships. We want them to be companions on our journey as we grow. That’s where the trust will come from. Quality remains important for this business and we find that publishers like what we are doing with the brand and over time become loyal. It’s a symbiotic relationship. We normally work with around 10 publishers at any one time, with maybe three or four providing most of the volume. Clickbooth works with us to ensure quality. They will often pass publisher creatives to us for approval and are always asking for quality reports. In combination with our internal systems it means that our traffic quality is really good. As our advertiser conversations wound down what became apparent was that a state-of-the-art CPA network should not be seen as simply an aggregator of publisher connections. Instead, advertisers should understand that what they need is a performance marketing partner, and that partner should be able to bring experience, scale, technological expertise, financial stability and a deep understanding of how to run a successful campaign. Here’s the takeaway: the industry is growing up. As part of that, Clickbooth has a clear vision and with their new investment is pushing things forward. As a result, they have helped us double in size in the last 12 months. That’s really the bottom line. A great CPA network should help their advertisers grow. Clickbooth has delivered on that promise for each of our interviewees. Digital advertisers often need help through the maze of issues that performance marketing can present. The recruitment and management of publishers is a huge job on its own, but in combination with technological, traffic quality and scalability challenges, the task of running one or more CPA campaigns without a network partner becomes very intimidating. Clickbooth exemplifies a new breed of CPA networks, offering highly professional levels of customer service and support, together with sophisticated tracking and compliance technology, and years of experience in the industry. Our four interviewees, leading advertisers all, are among the best in the business. It is no surprise that they have chosen to partner with the Blue Book’s #1-ranked CPA network, Clickbooth. *Please note that some names have been changed to protect certain commercially confidential information. Clickbooth is a technology company that takes a programmatic approach to traditional performance marketing resulting in zero risk and higher returns for clients. The company’s proprietary performance exchange provides advertisers looking for new customer acquisitions access to the largest distribution network of online marketing experts, specializing in display, social, native, search, email and contextual traffic. Affiliates using the platform see 30% higher EPCs and let the platform handle optimization, cap management and offer testing for them, allowing them to aggressively scale their businesses.